Whether I want to believe it or not, another year has come and gone. What's good about it is that this is the one time of the year I turn my latent statistician loose on all sorts of graphs. I've also done something new, but only time will tell if all the bells and whistles work. Now on to all those numbers-- they're so last year! 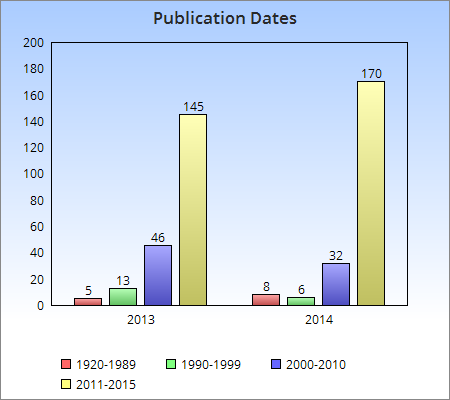 First off, as you can see, I've compiled five years' worth of statistics now, and for the second year running, I've managed to keep my eyeballs in high gear. 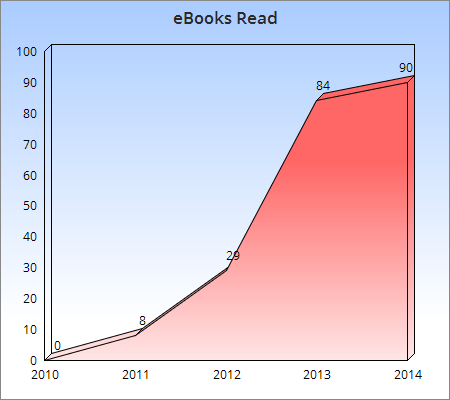 200 books is a lot of books, and I've signed up for the Goodreads challenge at the same amount for 2015. I won't kick myself in the hiney if I don't make it, even if I do keep that "So many books, so little time" firmly fixed in my mind! This next graph makes me wonder what happened in 2010 and 2012. I must've read a bunch of skinny books! 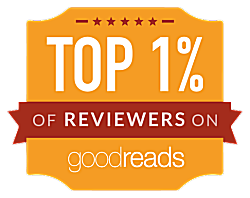 Ratings are up next, and it would appear that the highest rating (A+) as well as the lower (C, D, DNF) remain fairly stable, but as I read more books, the As and Bs are climbing steadily. Thank heaven I tend to be a good judge of finding the books that I will enjoy reading! 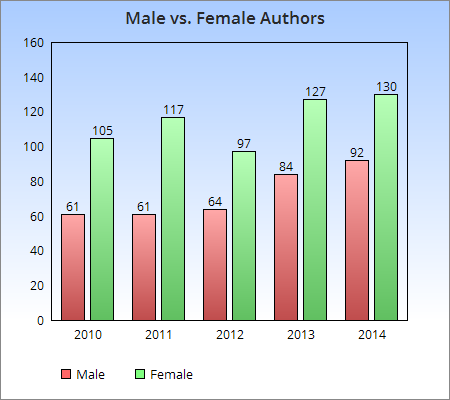 After 2012, I told myself that I wanted to read more books written by male authors-- and I have-- but it seems my preference will always lean a bit more toward female writers. Could that ever change? It's not completely out of the realm of possibility! I also like to keep track of the new-to-me authors I've sampled throughout the year. 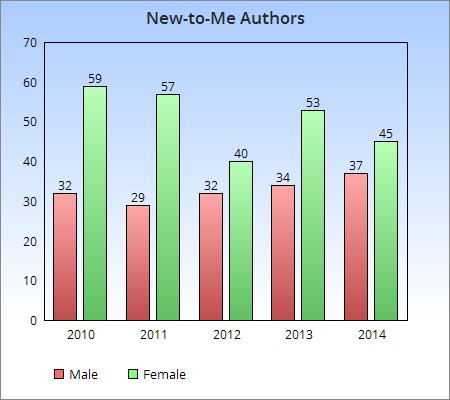 Still the same slight preference for female authors, but I find it interesting that although the number of new male authors has slowly risen, the number of female writers has shown more variance. 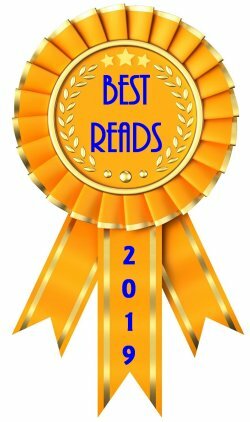 Yes, compared to the number of mysteries I read, I read few non-mysteries, but my #1 book of 2014 was non-fiction (When Books Went to War), and I have some choice ones sitting on my TBR shelves, so that number may change in 2015. I've fallen off cozies a bit. I've found too many rely on gimmicks-- or "hooks" as they say in the business-- and leave a bit to be desired in character development and plot. I'm not giving them up, though! In many ways I'm proudest of that little green line. 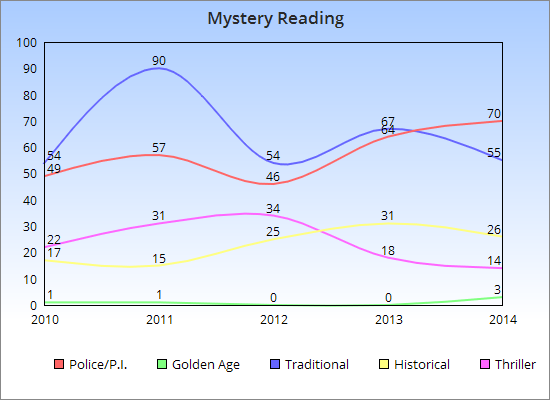 Golden Age mysteries are on the rise! Where do I get all the books I read? Although I support our library system, I don't borrow books from my local library. I know. Shame on me! Due dates and I don't get along unfortunately. 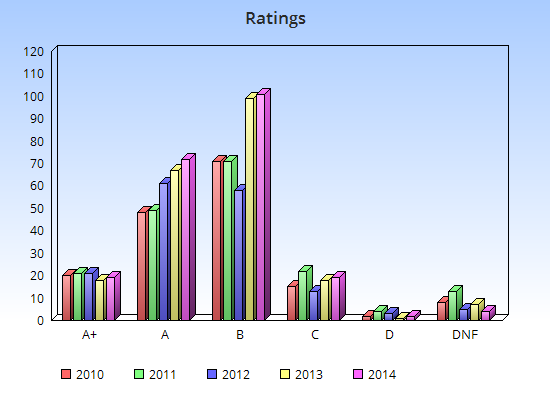 I ended 2012 as a grumpy reader, and when I put all my stats together, I saw why. More than half the books I read were advance reading copies (ARCs). I give those books precedence, always posting my reviews during the first week of release, and usually on the day of release. Too many deadlines sapped some of my pleasure in reading, and I'm happy to see that I'm reading more of the books I purchased and swapped than I am of ARCs I received. I'm like a kid at Christmas with those ARCs though, so they'll never completely go away-- at least not in the near future. I love reading books before they're hot off the presses! Here's another statistic that proves I love books hot off the press. 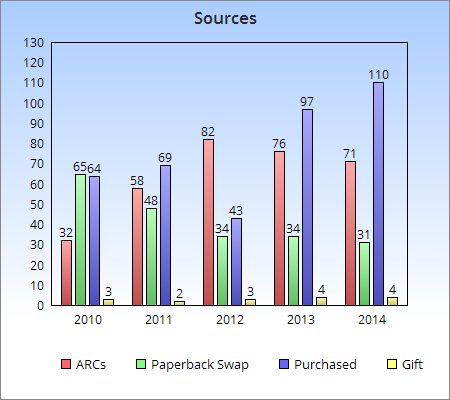 I began collating this information in 2013, and as you can see, the vast majority of the books I read have been published in 2011 and later. I do find it interesting that the 1920-1989 group has risen while the 1990-1999 has fallen. Gladys Mitchell, Dorothy L. Sayers, and Josephine Tey are making their mark! 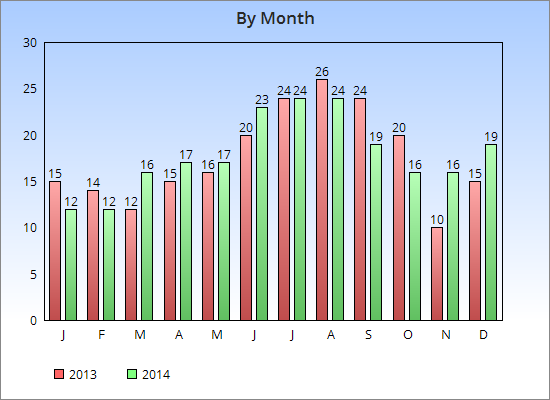 Another statistic that I began keeping in 2013-- how many books I read each month. It's easy to see that June, July, August, and September are the months when I read out in the pool. September 2014 saw me read fewer books because of the huge monsoon storm that flooded out the pool. I had other things to do than sit in a huge mud hole and read. Also-- November and December 2014 saw me reading more because (1) I didn't put up any Christmas decorations, and (2) I didn't do any holiday baking. It's no secret that I've long been an armchair traveler, and I keep track of the countries I visit in the books that I read. I thought using a map would be better than graphs that can't show all the countries properly. (The only gripes I have with this map is that I "visited" Antarctica and Mars, and neither are included on this map!) If everything works the way it should, you should be able to use the zoom function (+/-), and if you hover your mouse over a country, its name should appear. That zoom function should come in handy, since some of the places I visited are mere specks in the middle of one ocean or another! On another note, I did do a map showing the states I visited as well, but I got tired of fighting the Battle of Competing Code and decided not to show it. I was favorably impressed however because it showed I visited a lot more states than I thought I had! Here's another one that relies on bells and whistles. I kept track of all the cities I visited in my reading this year. You should be able to use the zoom (+/-) function to the left, and if you hover your mouse over any of the red markers, you should be able to see the name of the city as well as the titles of the book(s) I read that were set there. Naturally, this doesn't include any of the many books I read that were set in fictional places. How you doing? Have you OD'd on graphs and maps yet? I hope everything worked properly for you. It's always difficult to know if some of these fancy things will work with everyone's operating systems. If you have any problems, please let me know in the comments so I'll know whether or not to use the maps on my next end-of-year wrap-up. Some of you probably think this is a whole lot of work for very little gain, but it's fun for me as well as being enlightening. 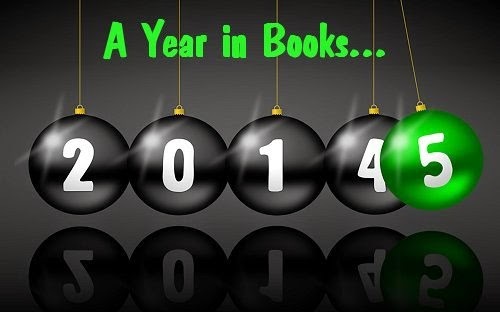 May your 2015 be filled to overflowing with wonderful books! I found it all quite fascinating, Cathy. Especially the maps. 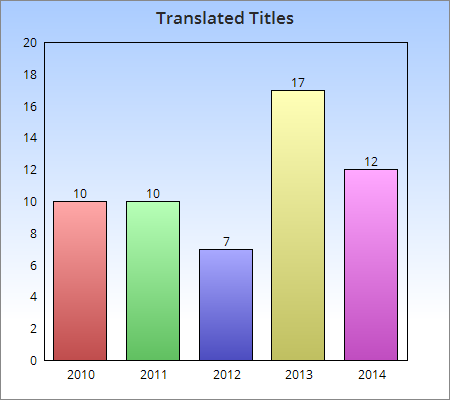 Happy reading in 2015. Thanks, Cath. The very same to you! The fewer clunkers the better, eh? Love your breakdown, I'm too lazy too keep track of details though it might be interesting to do it. Thanks for sharing, and congrats! I'm glad you enjoyed it, Shelleyrae! I love looking at all your graphs and stats! I wish I were that organized. Amazing, Cathy! Loved the maps. 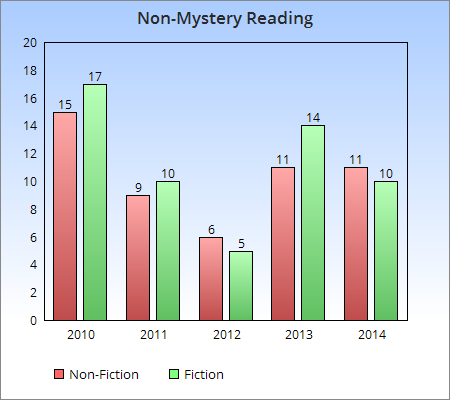 I'm thinking about what to put on the schedule for the second half of 2015 for the mystery book group I moderate. Want to do a "area of the world" theme for August. We did a "Mediterranean Cruise" this last year. I'm thinking of Australia, New Zealand, Solomons, etc. Think there are enough mystery series set there that might be in the library? I think probably so. 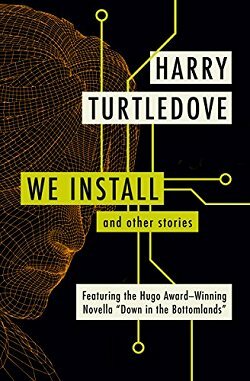 There are several series that you've mentioned or reviewed that I've meant to pick up and read. I'll take a look at your maps in more detail. It's definitely a part of the world that's worth a bit of checking into, Kay! Lol! I think that last map would drive me crazy in short order, the way it jumps around. Amazing record keeping, that. I'll probably update my list of read books soon. Dad died October 31, and I've just about recovered enough from the stress of all those months of caregiving that I can contemplate blogging without thinking it's too much trouble. Also have to sort through my Arizona photos and experiences and get some stuff posted on that, too. I found it didn't jump as badly if I used the zoom feature, but yes-- that does bother me, and I don't know if I'll use that particular map for next year's post. It's good to hear that you're recovering. It takes time. I look forward to seeing and reading about some of your Arizona experiences! How delightful to see your chart-filled post pop into my RSS reader. I had a bit of a dud year last year so wasn't able to pull together my normal array of charts and felt out of sorts about it - but seeing yours has made my inner chart nerd whole again. We inner chart nerds must help each other in times of need! Congratulations on your book reading and letting your inner statistician come out to write up these conclusions. I enjoy reading books from Australia, and there are so many great authors there, women and men. It is a hassle that many of the contemporary books are not available over here and buying and having them shipped here is quite costly. And I fell down this year in my global reading challenge by not reading a book set in South America. It's hard to find these authors here. I wish you a great reading year again. I just finished J.K. Rowling's The Silkworm, and am in recovery now after finishing it. It's brilliant in places, but gruesome and it is set in the publishing world which is portrayed as very brutal. Now I've got Tana French's The Secret Place, and Sarah Waters' The Paying Guest to read. Yes, traditional mysteries do seem to be the domain of women writers, don't they? 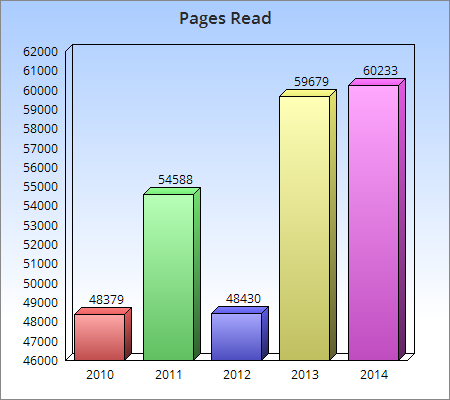 But my reading of those has dropped over recent years. I realized that my peak of cozy reading was the year I had my cancer surgery and the subsequent recovery. Evidently my mind just wasn't in the mood for serial killers and the like! 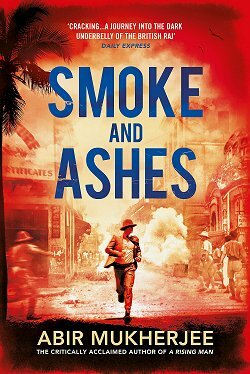 I agree totally about Australian mysteries... and we used to be able to count on at least one superb mystery set in South America each year. I miss Leighton Gage. It's an ache that just won't go away because not only was he a marvelous writer, he was a wonderful human being. Thanks for being one of my dedicated readers, Kathy. You-- and all the others-- are very much appreciated.